Years later, Trey goes to a strange camp that is meant to save troubled teenagers. It's packed with crazies, god-botherers, devoted felons and broken kids. Trey's been in and out of trouble ever since the day the bad thing happened, but he's not here for saving: this is where he'll find the man who did it. Revenge and healing, salvation and hell are a boiling, dangerous mix, and Trey finds himself drawn to a girl, a dream and the offer of friendship in the dark . When you think about it, the business of living boils down to a string of decisions; seemingly insignificant decisions about little things, largely, like whether to take the left road or the right. Maybe one direction gets you to your destination without delay on this postulated day, and perhaps that matters, but taking the long way could lead, equally, to a chance meeting that leads to laughter that leads, at the last, to love. What I mean to say is that, in a very real way, we're changed by our choices—made or broken or both. Take Tremain Pearce, the deeply damaged protagonist of Natasha Carthew's languid but ultimately uplifting latest. When a man murders his mother and father, and hurts his big brother Billy so seriously that he'll require round-the-clock care for the remainder of his days, Trey chooses to make the guy who got away with it pay: a decision that determines the lot of his lamentable life from that sickening instant on. "If he was to have any chance of finding out the truth he had to keep to the rules and gain the masters' trust no matter that he hated them all," (p.23) but this is demonstrably easier determined than done. To wit, it isn't long before Trey starts attracting exactly the wrong sort of attention: from DB and McKenzie, the hectoring heads of house, as well as Wilder, the biggest bully in Camp Kernow and a particular pet of Preacher, who may—or may not—be the reformed monster our kid has come to kill. Eight years on from that devastating day, how in the world would he even know? Stumped in much the same way readers of The Light That Gets Lost are likely to find themselves at first, I'm afraid. To be sure, it's brilliantly written, as the wonderful Winter Damage was before it, but whereas Carthew's Carnegie Medal nominated first novel let in a little light when the time was right, the bulk of her new book is almost completely bleak. The appalling events of the prologue turn Trey into a stone-cold central character so single-minded in his mission that there's no room in his heart for humour or beauty, thus the kindness of strangers like Lamby—a spirited kid who bears the brunt of Wilder's wickedness with a lopsided smile—goes nearly unnoticed for perhaps half of a narrative reminiscent in its relentlessness of Emma Donoghue's Room. 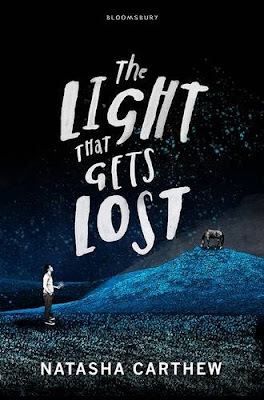 Happily, The Light That Gets Lost is like a whole other novel—Lord of the Flies, in fact—from the midpoint on. Not necessarily a nicer novel, I'd note. The fiction is no funnier or finer as Trey and the friends he finally makes are forced to prepare "for something that they didn't want to prepare for; something beyond youth and courage and reasoning" (p.170) when catastrophe comes to Camp Kernow. 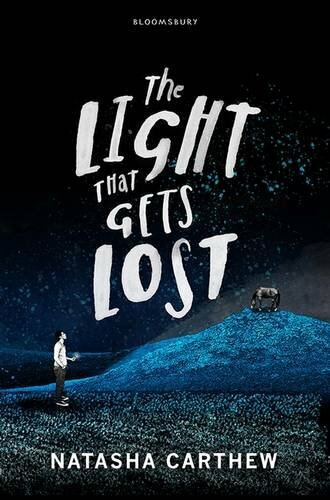 Yet in the wake of the confrontation that Carthew's text turns on, our protagonist's perspective becomes markedly more measured and sympathetic, such that there looks to be something other than savagery at the end of the tunnel The Light That Gets Lost represents.